12″ LED under cabinet light bars for cabinets and counters. Built in adjustable angle mount. Can also be used as cove lighting. 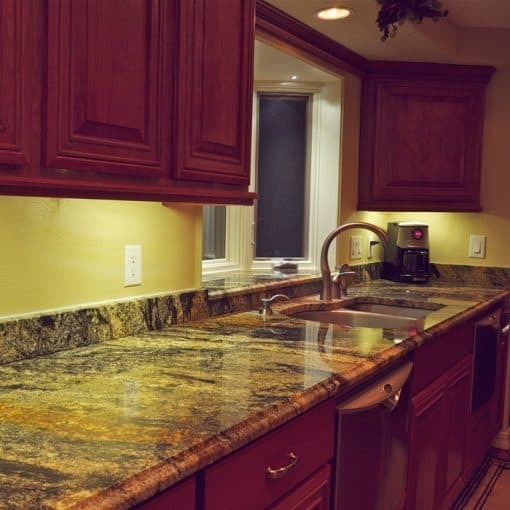 Highlight your countertops and backsplash, light dark corners, and eliminate shadows with these adjustable angle LED light bars. Make task areas more functional. Brighten up your kitchen during the day, add safety at night. Do it yourself with our easy-to-install Under Cabinet Light Bars and accessories featuring Plug-N-Play connectors. DEKOR® professional quality under cabinet light bars can create a continuous stream of light under and across a large span of cabinets when connected in line. Our wide variety of connectors and controllers, and the ability to chain many lights in sequence makes ours under cabinet lights suitable for even very large kitchen lighting design projects. 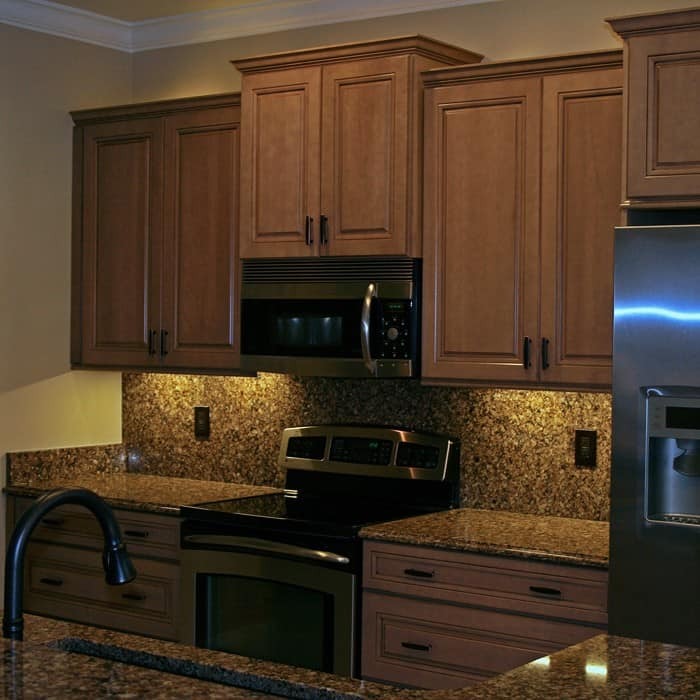 Our LED under cabinet lights offers the performance and reliability of far more expensive under cabinet lighting systems at a fraction of the cost and energy use. EZ Plug-in Installation A screwdriver for the built-in mounting hinge is all you need. 5 Watt Maximum Consumption. Saves on energy. 12 Voltage (12VDC) high energy efficiency, low heat, long lifespan, and safe. 120 Degree Beam Angle for optimum under cabinet lighting. EZ Dimmer Control Set brightness to desired level using the optional Dimmer. Use under cabinet, under counter, or as cove lighting. CE, RoHS, ETL (US and Canada). Download LED Under Cabinet Light Bar Installation Instructions as a PDF. 5 Year Warranty when used with a DEKOR® brand transformer. LED under-cabinet lights. I received your lights and installed them. WOW! They perform great! I can’t believe how easy it was to install them and they look terrific … We put in our new granite counters and now are picking out new backsplash and the kitchen will have a complete makeover. I like the fact that these lights perform as well as what a friend put in for $1,000 and I installed them in a few hours for less than half the price, and you can’t see any wires. This is Bob from Simply Cabinets in Punta Gorda, FL. … I wanted to give you access to a series of hi-resolution photos of a small kitchen remodel that we recently completed where we used your De-Kor LED under-cabinet lighting for the 1st time. Our client was so amazed by both the quality and uniqueness of the De-Kor Lighting product. The client especially loved the idea that the lighting is remotely dimmable. We now have 5 additional projects in the works where we will be using your product. One of which will contain over 15 under-cabinet lights [which is only possible using your product] and our new mobile showroom [which is 95% complete]. After installing my DEKOR under cabinet lights, I was very impressed with the quality and warmth of the light as well as the ease of installation. The lights, combined with the EZ Remote Dimmer, allow me to set the mood in my kitchen with ease. The thin profile of the lights combined with the energy savings of LED lighting make the DEKOR under cabinet lights the only sensible choice for kitchen lighting needs.